WRITTEN TYCOON (AUS) (Chestnut 2002-Stud 2007). 2 wins at 2, STC Todman Slipper Trial S., Gr.2. Leading Aust. Sire of 2YOs 2015-16. 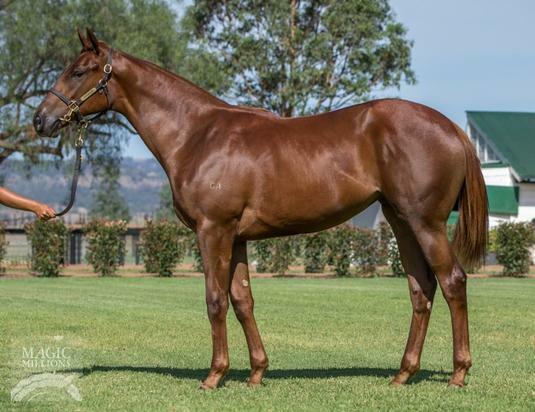 Sire of 540 rnrs, 398 wnrs, 24 SW, inc. Capitalist (ATC Golden Slipper S., Gr.1), (La) Luna Rossa, Tycoon Tara, Music Magnate, Written By, Howmuchdoyouloveme, Super Cash, Winning Rupert, Rich Enuff, Booker, Written Dash, Trump, Vibrant Rouge, Hot Dipped, Grande Rosso, It is Written, Balf's Choice, Grand Tycoon, etc. Invincible King (g. by I am Invincible). Placed to 2018-19 in Aust. Cheville. 7 wins to 1450m, A$100,685, 2d MRC Ladies in Racing Magazine H., 3d Darwin TC Palmerston Sprint H.
Falcons Reach. 3 wins at 1400m, 1600m in 2016-17 in NZ. CROWDED HOUSE (Rainbow Quest). Third on The 2008 European 2YO Free H. 2 wins at 2, £346,855, US$276,176, 294,400Dhs, Doncaster Racing Post Trophy, Gr.1, 2d Del Mar Pacific Classic S., Gr.1, Meydan Al Maktoum Challenge Round 2 S., Gr.3, Al Rashidiya S., L, Newmarket Tattersalls Timeform Million 2YO S., 4th Woodbine Mile S., Gr.1, Del Mar Eddie Read S., Gr.1, Sandown Gordon Richards S., Gr.3. ON REFLECTION (Rainbow Quest). 4 wins-1 at 2-from 1600m to 2300m, €99,525, 44,270fr., Marseille-Vivaux Grand Prix Gaston Defferre, L, 2d Grand Prix de Compiegne, L, Saint-Cloud Prix Gris Perle, 3d Vichy Prix Berteux, Gr.3, Chantilly Prix de la Montre, 4th Saint-Cloud Prix du Lion d'Angers, L, Toulouse Le Vase d'Argent, L. Sire. Rionach (Sea the Stars). 2 wins at 7½f, 1m in 2018, 2d Killarney Ruby S., L, 3d Galway Colm Quinn Mile H.
INVINCIBLE WARRIOR - ABLE WARRIOR (H.K.) (Invincible Spirit). 4 wins-2 at 2-at 1200m, Doncaster S., L, HKJC Chamber of Commerce Cup, Po Leung Kuk Centenary Cup. HAMP (Sky Mesa). 4 wins-2 at 2-at 5½f, 1m, US$201,169, Pimlico Henry S Clark S., L, 2d Churchill Downs River City H., Gr.3, 3d Laurel Marylander S., L, Japan Racing Association S., L, 4th Belmont Forbidden Apple S., L.
BRANDO (Pivotal). 8 wins to 1300m, £623,069, €244,732, to 2018, Deauville Prix Maurice de Gheest, Gr.1, Sandown Sprint S., Gr.3, Newmarket Abernant S., Gr.3-twice, Ayr Gold Cup, Newmarket Turftv H., Haydock Godfather Travellers H., 2d Newmarket July Cup, Gr.1, Haydock Sprint Cup S., Gr.1, York Duke of York S., Gr.2, Curragh Sapphire S., Gr.2, Royal Ascot Wokingham S., York Jack Berry House S., 3d Ascot British Champions Sprint S., Gr.1, Newmarket July Cup, Gr.1, 4th Curragh Greenlands S., Gr.2. WAR DECREE (War Front). 3 wins-2 at 2-at 7f, 10¾f, £158,305, €90,218, to 2017, Goodwood Vintage S., Gr.2, Dundalk Diamond S., Gr.3, Leopardstown Irish Stallion Farms 2YO S., 2d Newmarket Superlative S., Gr.2, Chester Huxley S., Gr.2. RECKLESS ABANDON (Exchange Rate). Joint Champion 2YO Colt in France in 2012. Champion 3YO Sprinter in Europe & GB in 2013. 5 wins at 2, £162,868, €284,100, Deauville Prix Morny, Gr.1, Newmarket Middle Park S., Gr.1, Royal Ascot Norfolk S., Gr.2, Maisons-Laffitte Prix Robert Papin, Gr.2, 2d Doncaster Scarbrough S., L, 3d Haydock Temple S., Gr.2, Newmarket Hopeful S., L. Sire. BEST APPROACH (New Approach). 3 wins-1 at 2-from 2000m to 2400m, 91,217,000¥, to 2018, Tokyo Metropolitan S., L, Hanshin Amagasaki S., 2d Tokyo TV Tokyo Hai Aoba Sho, Gr.2, 3d Kyoto Radio Nikkei Hai Kyoto Nisai S., Gr.3.